HFH WI is teaming up with HFH Honduras to build ten homes in the remote village of Ahuas. The people of Ahuas are mainly subsistence farmers, planting rice, beans, and yucca. Sixty-five percent of the inhabitants live on less than $1.90 a day. To date, HFH Honduras has built, rehabbed or repaired 171 homes in La Mosquitia, most of them in the larger town of Puerto Lempira. Within the municipality of Ahuas, eleven homes have been built for disabled divers with help from the local hospital, Clinica Evangelica Morava. Many families live in wooden homes with dirt floors. They have thatched roofs, which are cool, but they do not last long. And bamboo walls do not keep out heavy rains or mosquitoes. 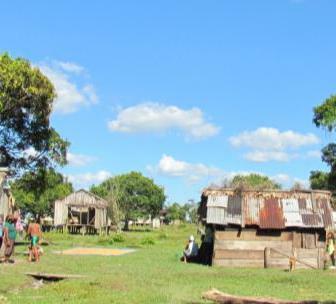 Build ten homes for families in Miskito over a 12-month period. Each partner family will also have a chicken coop and ten hens as a means to increase income. Homes will have concrete foundations, floor, and exterior walls. Interior walls, doors, windows, and rafters will be built of locally harvested rough-cut lumber (pine). Roofs will be made of corrugated tin. Each home will have two bedrooms and one larger room that functions as living and dining space. If you would like more information about the Ahuas project, please contact Sara Kierzek by email or call 414-517-9251.